Humanity is on the precipice of a space age. The Space Foundation estimated the value of the global space economy at $330 billion USD in 2014, growing at nearly 10% annually. At this rate of growth, the space industry could be worth over one trillion dollars (equivalent to the total GDP of Sweden, Finland, and Norway combined ) by 2025. Only a small percentage of that total can be attributed to government space agencies. In 2014, NASA's annual budget only accounted for about $17.7 billion, with another $19 billion to come in 2017—that's a financial contribution of less than 5% of the global total for all space activities. All said, commercial space activities account for >75% of the global space economy, mostly from communications satellites in Earth orbit. And that's a good sign for our future space age—but before we get ahead of ourselves, here are a few space-related issues that we desparately need to solve. As things currently stand, outer space is given the same legal precedent as that of international waters and the continent of Antarctica. It's a place anyone can go and freely travel through, but international treaties prevent anyone from making territorial claims. This agreement probably won't last forever. The original Outer Space Treaty signed in 1967 is outdated and seriously behind the times—in fact, all of our space policies are in need of some serious overhaul. This is particularly apparent with regards to space property rights. Who owns this big space rock? Nobody really knows... Image: Deep Space Industries, by Bryan Versteeg. Of course, we would like to think of space as the collective inheritance of all humankind, equally. But it might not stay that way. As soon as asteroid mining becomes feasible and some public or private entity decides to go ahead with space resource exploitation, we're going to have a serious international problem: who will those resources belong to? Can anyone own an asteroid or parts of an asteroid? And if so, is it going to be privately owned or publicly owned? These are important questions that we should solve before they become tomorrow's news headlines. Throughout human history, wars have been fought over control of valuable resources. If any one entity develops the technology to start controlling and harvesting resources from space, we'll be venturing into uncharted legal territory. 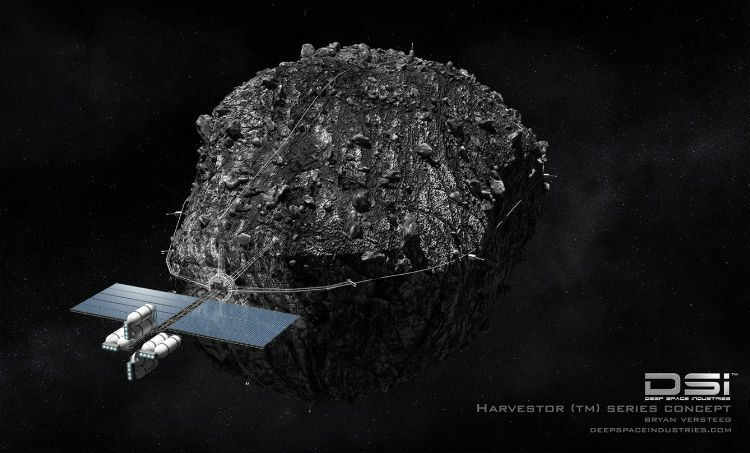 Perhaps harvesting one of the tens of thousands of Near-Earth Asteroids wouldn't be such a big deal. But what about staking a claim on the Moon? Or on a larger object in the asteroid belt, such as Ceres? Or on entire populations of asteroids? If that's allowed, where would it stop? Will a company investing billions of dollars on developing a space mining infrastructure be able to claim vast swathes of land on the Moon or Mars? While revised treaties may be able to mitigate some of these problems, the temptation is going to be there, and private industry is always going to find a way to operate in some sort of legal grey area—as will some government entities. The Outer Space Treaty prevents any nation from claiming territory on any of the celestial bodies, but there aren't any provisions for handling a breach of this treaty—there's no international governing body overseeing space activities. It's important to note that there's also a flip-side to this. By banning the right to own property in space, we're losing out on a substantial real-estate industry that could, all by itself, fully fund the development of a sprawling lunar colony by way of speculative real-estate investment. One could imagine hordes of would-be space investors launching at the opportunity to own their own little slice of Moon-land. The economic benefits would certainly be there, but we should first seriously consider the pros and cons of such a venture. Plots of land on the Moon could end up becoming prohibitively expensive, and may only prove economically beneficial to those at the very top of the economic ladder. If we're going to continue to promote space as the common inheritance of all humanity, then we need to remain serious about protecting the interests of everyone over those of the wealthy elite. The problem we currently face is that as private space companies become more involved with the politics of outer space, our utopic vision of collective ownership of the cosmos will come under increasing threat. As the commercial space sector continues its meteoric rise (pun intended), we're going to need a way of regulating and governing humanity's ever-increasing presence in space. That will probably require an international governing body—sort of like the United Nations, but with complete jurisdiction over all space activities, period. 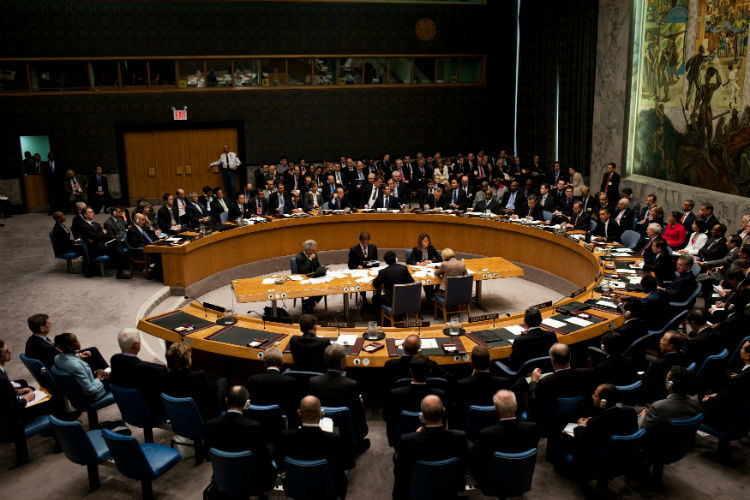 This is a United Nations meeting about non-space-related things. Image: Wikimedia Commons. Sure, most commercial space activities are currently limited to Earth imaging and communications satellites. But the tide is changing. SpaceX is planning to send humans to orbit the Moon in 2018. After that, they want to go to Mars. Five startups are currently competing to land the first privately-funded robotic spacecraft on the Moon before the end of 2017. And, of course, Mars One wants to send a group of human settlers on a one-way trip to the red planet—just as soon as they can secure the funding for it. All of this activity currently falls under the original 1967 space treaty, a document which didn't even take into account the interests of private spaceflight companies (none existed at the time). As far as space law goes, we're ill-equipped to deal with the demands of the 21st century space industry. We're completely devoid of an adequate policy framework for a range of issues, including: resource mining, sample-return (such as Mars), commercial human spaceflight, space tourism, and asteroid detection and deflection, just to name a few of the bigger ones. It also doesn't matter at all if only one country enacts laws or policies to address these concerns; any such action would only take effect for launches from that specific country. If some private company didn't like a particular law enacted in the United States, they could simply opt to move their launch operations to a different country that had more relaxed rules. In order to ensure the sustainable and responsible use of space, we'll need to enact a series of updated treaties that address the various issues of the modern space age. But perhaps of most pressing concern is the way in which we manage the thousands of tons of hardware currently floating around in Earth orbit. There's a lot of stuff floating around in Low-Earth Orbit: old rocket boosters, defunct satellites, parts of defunct satellites (like loose bolts and paint chips), and even human feces that's been ejected from the International Space Station. 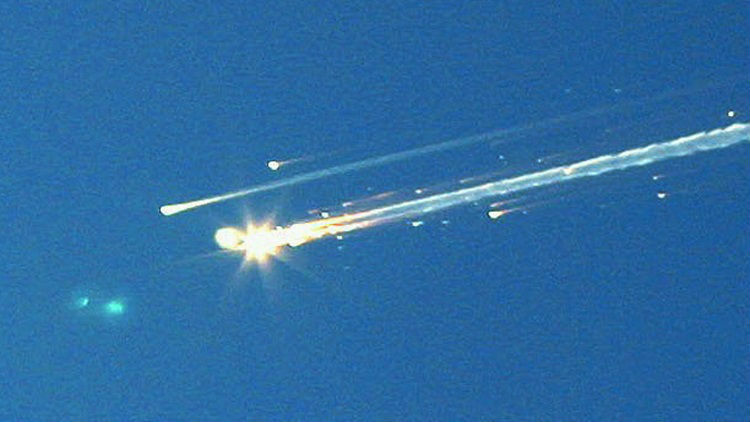 Space Shuttle being destroyed by debris. This is definitely a scenario we want to avoid. 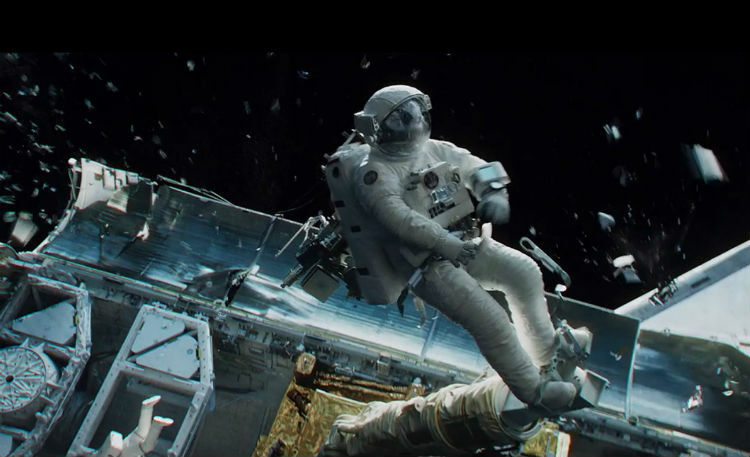 Image: Gravity (2013). This growing problem could become substantially worse if more isn't done to prevent it. While protocols have been put in place by which commercial operators are encouraged to include the ability to de-orbit their satellites at the end of their lifespans, most of the hardware up there doesn't have this capability—and there's no international agreement to try and enforce it. But apart from prevention of added space junk, if we want to keep future satellites from being destroyed in orbital collisions with old hardware (and astronaut poop), we need some way of removing some of the stuff that's already up there. Numerous robotic spacecraft capable of de-orbiting old space junk have been proposed, but most of them lack proper funding. Unfortunately, there's no international governing body (this is becoming a common thread) overseeing the development of a junk removal system, and no singular space agency has taken responsible for seeing such a project through. For this, there is a simple solution. If all of the space-launch capable nations of the world were to agree to enforce a junk-removal tax on all new launches, then the funds from this tax could be funneled directly into implementing a space-junk removal system. Only payloads lacking the capability to de-orbit themselves would be subject to the tax and, over time, most operators would opt to include de-orbit procedures in order to avoid additional costs (whereas the current model doesn't reward the capacity to de-orbit old satellites). With hundreds of rocket launches per year, it would only require a tax of, say, one million dollars per launch; this would fund the development of a harpoon-wielding spacecraft capable of tossing defunct satellites and hardware into a lower orbit where they can burn up in Earth's atmosphere. Obviously, anything involving a robotic space harpoon must be a good idea. We just need a little bit of international cooperation in order to get the ball rolling. Space is dangerous. So are a lot of things—like sailing out in the open ocean or working in a mine. Fortunately, we have search and rescue operations in case of capsized boats or mine tunnel collapses. But not for space disasters. With proper emergency preparation, the Columbia disaster could have been avoided. Image: Scott Lieberman. Ars Technica did a lengthy piece about a hypothetical rescue mission that NASA could have launched had it properly identified the damage to the Columbia space shuttle in time. Disaster could have been averted, seven crew members could have been saved, and the world could have been captivated by the greatest rescue mission ever attempted. Part of the problem leading up to the Columbia disaster was that there was no rescue plan in place already. Some of the subsequent space shuttle missions did include contingencies for rescue operations, but they were never needed. And no current human spaceflight program has any sort of backup plan in case something does go terribly wrong with an orbital spacecraft—like an engine misfire that could easily strand a crew of astronauts in Low-Earth Orbit until they run out of oxygen. There will come a point in the future where spaceflight is so commonplace that we'll need the equivalent of the Coast Guard for on-orbit rescue missions. And perhaps just as important is the need for proper certification and oversight in commercial spaceflight. Just as the FAA wouldn't allow a commercial airline to operate an unsafe airplane, so too should there be a spaceflight certification body that prevents unsafe (or untested) spacecraft from carrying humans into space. A perfect example here is that of SpaceX and its goal of sending two human (paying) passengers to orbit the Moon and return to Earth. What if they push forward with an aggressive launch schedule without first performing extensive tests? What if, on its maiden flight, the Dragon 2 capsule claims the lives of its human passengers? Who would be ethically responsible for their deaths? If airlines don't follow proper safety procedures and people die in an accident, then the airline is liable. The airline is responsible for ensuring that easily preventable problems don't occur—and this is made easier by the fact that mass-produced and well-flown airplanes have proven reliability track records. But when it comes to spaceflight, there's a much greater chance for things to go terribly wrong. Sure, certain professions have higher mortality rates than others, and if someone wants to kayak around the world solo, they're well within their rights to attempt to do so. While it's ultimately a matter of personal choice, we do have the infrastructure in place to at least try and safeguard people from unreasonable harm—as should be the case with spaceflight. Emergency preparedness should be all-encompassing. Not only do we need the capacity to launch space rescue missions, we also need to be able to take action against international treaty infringements (such as land-grabbing on the Moon), prevent actions that could cause great harm to humanity (such as putting nuclear weapons in orbit), and deflect potentially harmful asteroids before they're able to smash into Earth's atmosphere. None of these problems are particularly difficult to solve; we just need to invest the (relatively) small amount of resources it would require to address them. The cross-contamination argument runs the gamut from fantastical claims to serious scientific concerns. I'll briefly deal with the fantastical: there are some in the scientific community that have taken a strong stance against authorizing any sort of sample-return mission from Mars, for fear that Martian microbes might be brought to Earth and unleash a full-on pandemic that could wipe out a significant percentage of life on Earth. For a plethora of reasons, the chances of such a thing occurring are practically non-existent. Martian life (if there is any) is very unlikely to pose a threat to life on Earth. Rather, it's Earth life that's far more likely to pose a significant threat to any Martians. We'll have to be careful not to srpead our nasty bugs across the surface of Mars. Image: NASA. Planetary scientists are seriously concerned that by sending missions from Earth to Mars, our own microbes could find their way into Martian soil and contaminate the red planet. Similarly to how a laboratory here on Earth wants to avoid having any of its samples contaminated by foreign materials, so too do planetary scientists want to keep Earth life away from the pristine environment of Mars. Unfortunately, we've already sent these microbes. Studies have shown that our various robotic missions to the surface of Mars have carried with them a plethora of bacteria that are particularly hardy—that is, capable of surviving the vacuum and radiation of deep space. Even the most stringent cleaning methods aren't enough to fully decontaminate any Mars-bound spacecraft. As a result, we've been delivering Earth life to the dunes of Mars for decades already—and we may have inadvertently spread our dirty germs across the dunes of Mars already. It may be possible for Earth-based life to survive and multiply in the subsurface layers of Martian soil. But it may be equally possible that Earth-based life can't survive on Mars at all. Either way, we won't know—until we go digging. But even that's complicated. If we send robotic rovers capable of searching for life on Mars, this cross-contamination problem could prove troublesome. Any bio-signatures found on Mars will need to be looked at in a very skeptical light: is that Martian lifeform we just found, or is it an Earth-originating hitchhiker? It may turn out that the best way to answer this question will be putting humans on Mars who are capable of running more in-depth biological experiments. But the real problem here is sort of the reverse of the fantastical claims of Martian pathogens decimating Earth life: what if Earth life sent to Mars completely destroys any Martian life it encounters? If that does happen, then we'll never get the chance to study Martian life—it'll be long dead before we even get there. This is where the field of planetary protection comes in. While we may have contaminated Mars (to a greater or lesser extent), we can avoid further contamination of Mars and other celestial objects by a) avoiding unnecessary landings/collisions, and b) employing better sterilization procedures on all of our spacecraft. Otherwise, the only other lifeforms we find in the Solar System may end up being stuff that we brought with us. And it would be a damn shame to travel hundreds of millions of kilometers just to find more of those damn tardigrades.